Evenflo recently announced a voluntary recall on select models of its Evolve Booster Seat. Evenflo is a wholly-owned subsidiary of Goodbaby International Holding Limited. The company designs and sells strollers, car seats for kids, cribs, bicycles and other related items. Evenflo continues to show its commitment towards child safety by ensuring that all concerned parties get this information. The need for a voluntary Evenflo recall was motivated by the fact that some children can access and activate the harness adjustment button without assistance from adults taking care of them. By accessing the harness adjustment button, it means that the child can potentially loosen the harness. The harness adjustment button is interestingly located under a plastic shield between the child’s feet. 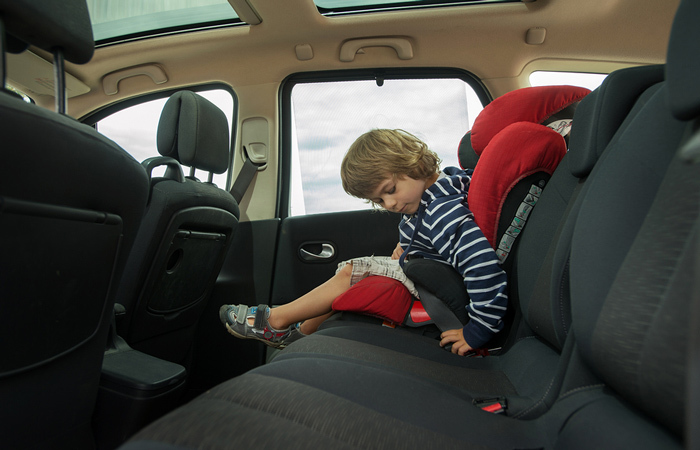 According to the National Highway Transportation Safety Administration, if the child is able to loosen the harness, the child may not be adequately secured which would increase the likelihood of getting injured if a crash was to happen. However, if your child matches the height and weight requirements needed for the belt-positioning mode that is stage two and three then it is safe to use the seat. The Evenflo recall is being done in collaboration with the U.S National Highway Traffic Safety Administration and Transport Canada. Fortunately, thus far no injuries have been reported to have occurred due to this defect, but Evenflo is taking no chances. Evenflo came to find out about this catastrophe waiting to happen through its regular review of consumer feedback. Children are known to be curious, and that curiosity led some of them to a point where they could fiddle with the harness button. Consumers had noticed that children could access and activate the harness adjustment practically on their own. Approximately 32,000 seats are affected. The Evenflo recall only covers the use of the seat in the harnessed mode. Evolve Booster Seats made prior to February 9, 2016, bearing the following model numbers are included: 34411700 (US), 34411741 (US), 34411700C (Canada). To know whether your child is using a seat affected by the Evenflo recall it is imperative that you visit the website www.evolve.evenflo.com. You will not only know whether your child’s seat is included in the recall but you will also be able to order a remedy kit. Alternatively, you can call Evenflo’s ParentaLink Consumer Resource Center at 1-800-233-5921 (US) or 1-800-265-0749 (Canada). At no point should you return the affected seats to the retailers. Moreover, if your child is accessing the harness then avoid using the seat until you get the remedy kit. The affected seats have a button that is used for adjusting the harness tightness. Children have no way of knowing the danger involved in fiddling with this button hence the urgent recall. So you may be asking yourself what will happen if I return my seat and are there costs involved? The simple answer to that is Evenflo is providing the remedy kit at no cost. The remedy kit has been modified to prevent your child from accessing and activating the harness adjustment button. The remedy kit will include a replacement harness adjustment button assembly and the much-needed installation instructions. The kit offers a push-style harness adjustment button which replaces the existing pull-style button. At the time, there is no class action lawsuit.